Inglourious Basterds is a film years in the making and hours in the watching, but it seems designed to inspire mere minutes of reflection. Quentin Tarantino’s long-discussed World War II movie—it’s been in the works in one form or another since Jackie Brown—features some thrilling action sequences, in which Tarantino’s gift for dialogue gets honed to a razor-dangerous edge, and some seamlessly integrated reflections on cinema’s role in shaping and reflecting history. But its moments of greatness—and there are more than a couple—feel weirdly disconnected, stuck in a movie that doesn’t know how to put them together, or find a good way to move from one to the next. Set, as the first of several chapter titles explains, “once upon a time in Nazi-occupied France,” Basterds pits the titular handful of Jewish-American soldiers and members of the French resistance against seemingly all of Nazi Germany. 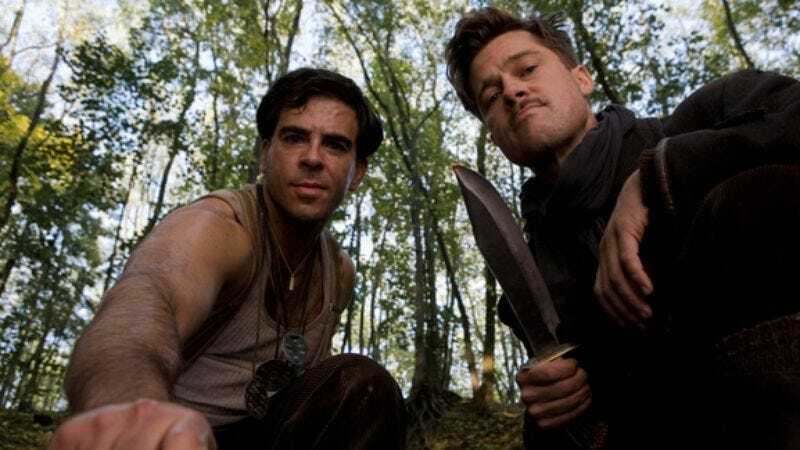 Brad Pitt leads the Basterds, whose bloody guerilla tactics give them frightening, near-legendary reputations. Even Hitler knows stories of the brutal, baseball-bat-toting “Bear Jew” (Eli Roth) and the somewhat less frighteningly named “Little Man” (B.J. Novak). Elsewhere, a Jewish woman (Mélanie Laurent) hides out in Paris and manages a movie theater that becomes the focus of a pair of plots against the Nazi presence, including the notorious colonel known as “The Jew Hunter” (Christoph Waltz), whose silky personality never masks his soullessness. As with Kill Bill, Tarantino draws on broad influences for a story about revenge. Unlike with Kill Bill, the disparate styles never cohere, and the vengeance carries virtually no ambiguity. They’re Nazis and they have it coming, each section reminds us, whether it’s staged like a spaghetti Western, an early-’80s music video, or as broad comedy. Tarantino remains a master of creating tension from characters engaging in what only looks like polite conversation, but the endless series of tense exchanges starts to feel flabby and unedited by the film’s end. So does Inglourious Basterds—a small, tight thriller stretched to epic length. There’s a feast here, particularly in the amazing opening, an unexpected essay on King Kong, and performances by Pitt, Laurent, and Waltz. It’s just been placed on a huge table with no consideration of whether it adds up to a meal.